Vrindavan, 2017.07.06 (VT; Photos by Anjali Syal): The rainy season has come. The kadamb flowers are blooming, ghevar is being sold in the sweet shops, and the sky has wrapped her soft blanket of deep blue clouds tightly around Vrindavan. It is so cool; so fresh and fragrant. The summer scorched us, but it also gave us the most gorgeous jasmine flowers, ripe yellow mangoes and juicy lychees to offer to our Beloved. 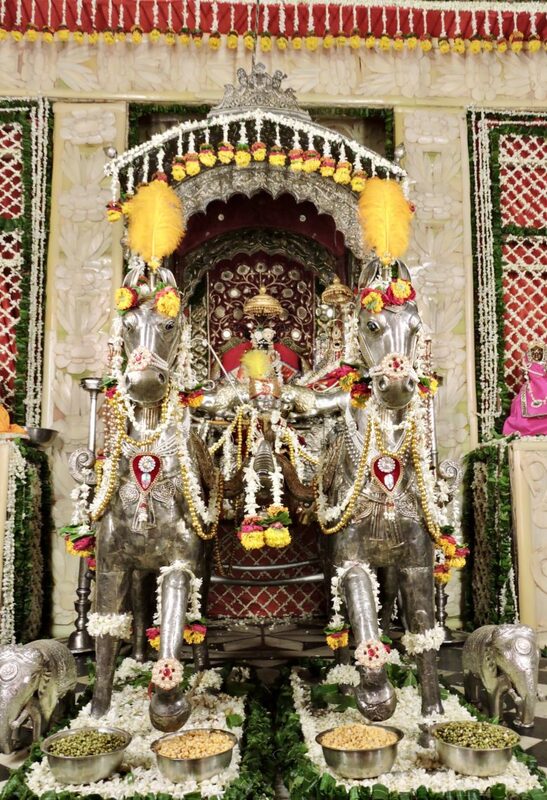 And best of all, it brought our pran Radharaman out into his jagmohan for this grishm kalin (summer) seva. By the blessings and inspiration of nitya leela pravisht jagadguru Shri Purushottam Goswami Maharaj, Shri Radharamanji’s nikunjas, also known as phool banglas (flower palaces) have been absolutely spectacular during this summer festival. Each nikunj has a special theme, for example the shopan (stairway) nikunj which was offered on June 23rd. This kunj is carefully crafted from fragrant flowers and slices of banana tree trunks, which shimmer elegantly like mother-of-pearl. Its five steps represent the five sacred moods devotees offer to the Lord: shant (a peaceful mood), dasya (servanthood), sakhya (friendship), vatsalya (the love of a parent) and madhurya (romantic love). On June 29th, Radharamanji enjoyed a “peacock-throne” kunj. The banana stems and flowers of this kunj are arranged and sculpted in such a way that Radharamanji appears to be surrounded by a peacock’s tailfeathers. 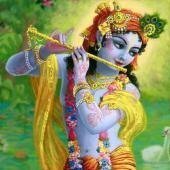 The bhav is that the peacocks have offered this special nikunj, endowed with their own beauty, to their Beloved Radharaman, and they are passionately dancing for him. But the highlight of these days was the Ratha Yatra. On this day, Radharamanji wore a stunning new red dress and sat in a charming chariot made of silver, complete with silver charioteers. 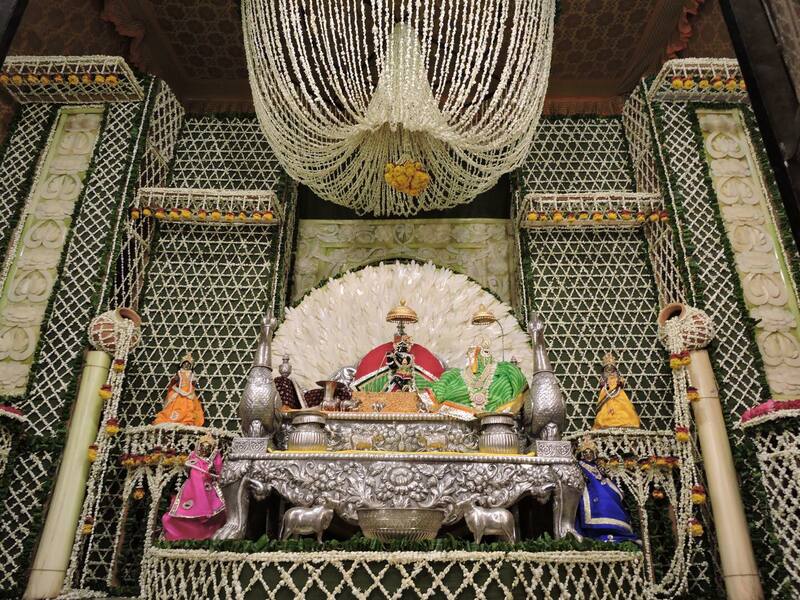 Devotees vied with each other to catch a glimpse of the Darling of Vrindavan as he sat on the rath with Radharani. 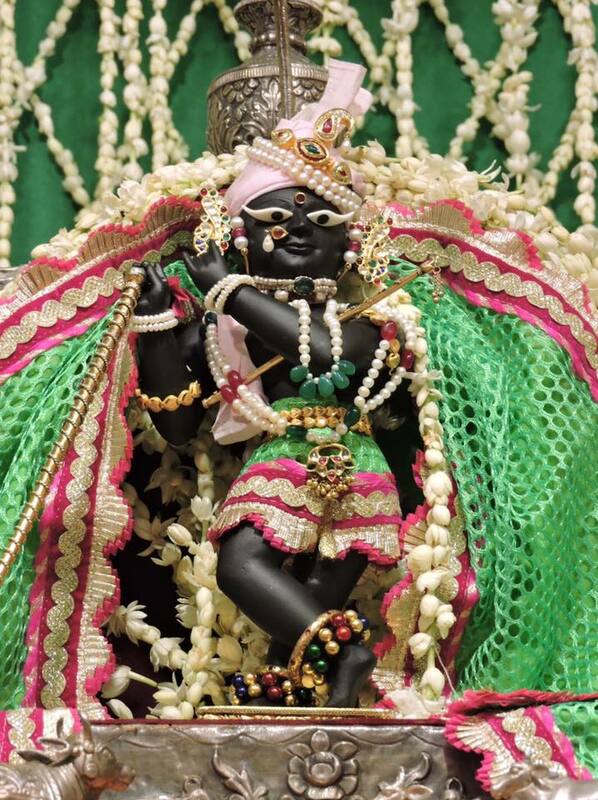 Shaligram shila was taken on a small procession around Radharmaanji’s jagmohan (the outer part of his altar). 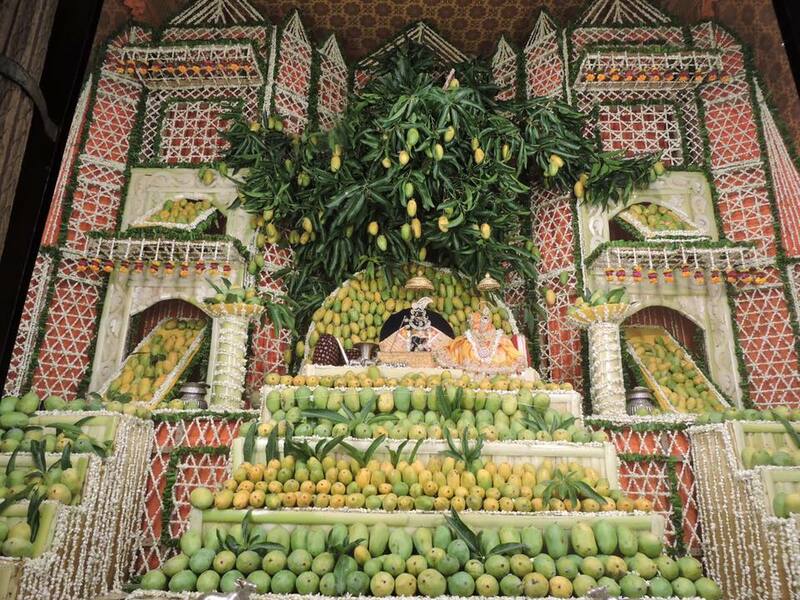 July 4th featured a very special kunj made of hundreds of mangoes! And on July 5th, the official final day of the seva’s transition, Radharamanji stunned the devotees in a vibrant sparkling green dress which perfectly evoked the special sweetness of monsoon.